The team of PGA Professional Brian Nosler of Portland, OR with amateur Spencer Klapp of Tualatin CC (Tualatin, OR) won the PNW Pro-Amateur Championship by one stroke this afternoon. 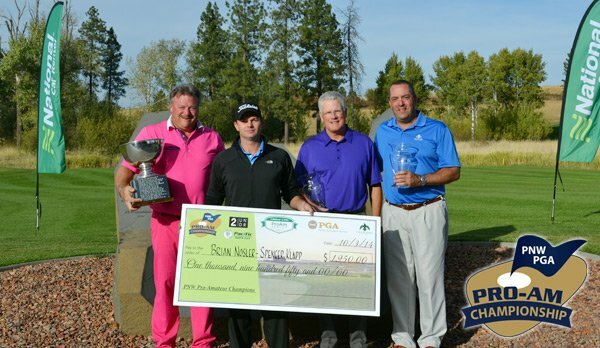 In a tie for second place was PGA Professional Rob Gibbons of Arrowhead GC (Molalla, OR) with his amateur Jay Poletiek of Riverside G&CC (Portland, OR) and PGA Professional Darin Vaughan of Twin Lakes Village GC (Rathdrum, ID) and his amateur Darren Slackman of The Creek of Qualchan (Spokane, WA). Nosler and Klapp came from two behind the leaders. They scored an eagle on their last hole to slide into the championship win. They posted six other birdies along the way to their final round score of 64, 8-under par for the day in the Four-Ball team competition. They were 15-under for the two day event. Sponsored by National Car Rental, the Official Rental Car of The PGA of America, the event is one of nearly 100 new and existing amateur tournaments across the 41 PGA of America Sections nationwide being linked together to form the Pro-Am Series. National created the tournaments to help further the PGA of America’s mission to grow interest and participation in the game of golf at local levels. The Series will run February through October 2014. In additional to National Car Rental, Pacific Turf & Golf is back as a supporting sponsor. 2UNDR also joined us this year. The Pacific Northwest Pro-Amateur Championship is under way at Circling Raven GC. 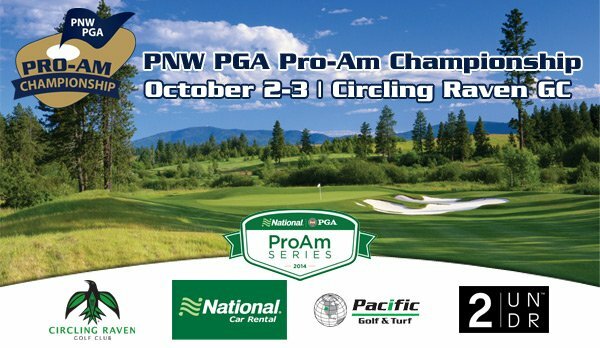 We have top PNW PGA Professionals and their amateurs all vying for the title of Pro-Amateur Champions. On Thursday and Friday we will have shotgun starts. The history of the Pacific Northwest Professional-Amateur Championship has been timeless. It all started when a young head professional named John Junor and his amateur partner won back to back titles at the magnificent Seattle Golf Club in 1924 and 1926 (no championship in 1925). Professional Walter Pursey and amateur Harry Givan topped Junor in the late 30’s with a three-peat victory at Seattle GC twice and Alderwood GC once. As the years went on, many great players etched their names into the record books as champions of this event. Long time professional Don Bies and his partners have seen numerous championships winning three of them in 1961 at Glendale CC, 1964 at Seattle GC, and in 1966 at Yakima CC. Other greats such as Bunny Mason (1963) and Jerry Mowlds (1969, 1978) have all had their share of the title. Circling Raven GC is a beautifully designed course that was built in 2003 by architect Gene Bates, Flowing through 620 visually stunning and inspirational acres adjoining the Coeur d’ Alene National Forest. Wildlife is abundant, including elk, deer, moose and an occasional black bear. Circling Raven has consistently been rated as one of the top Resort courses in the country. Golf Digest and Golf Magazine Golf World have rated it in their Top 100.